Oct. 15 (UPI) — Germany on Monday began plans to deport a member of the Hamburg cell that planned and carried out the Sept. 11 terror attacks after the completion of his 15-year prison sentence. Mounir el Motassadeq, 44, who acted as a bookkeeper for the cell and handled money transfers, will be sent to Marrakesh, Morocco. 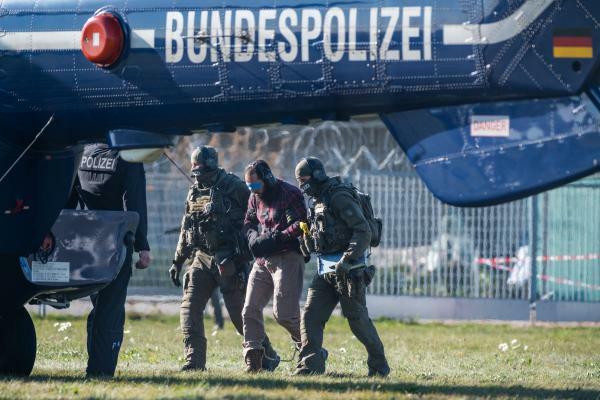 Hamburg Interior Ministry spokesman Frank Reschreiter would not reveal exactly when the transfer will take place out of safety fears, but armed police officers escorted Motassadeq to an airport Monday. “All the necessary procedural steps for this have been ticked off according to plan,” Reschreiter said. A German court sentenced Motassadeq to 15 years in prison in January 2007 for his role in the terror attacks, which left nearly 3,000 people dead. He was convicted and sentenced based on the deaths of 246 people aboard the four airliners used in the attacks. Motassadeq said that though he knew and prayed with the terror cell led by Mohamed Atta he was not aware of the 9/11 plot. He moved to Germany in 1993 to study engineering and spent some time in a military training camp in Afghanistan in 2000. It is believed his wife and three children are in Morocco. German officials banned Motassadeq from returning to the country until April 2064. “This measure will allow us to arrest him immediately should he set foot on German soil again,” Frauke Köhler, a spokeswoman for the Federal Prosecutors Office, told DW.